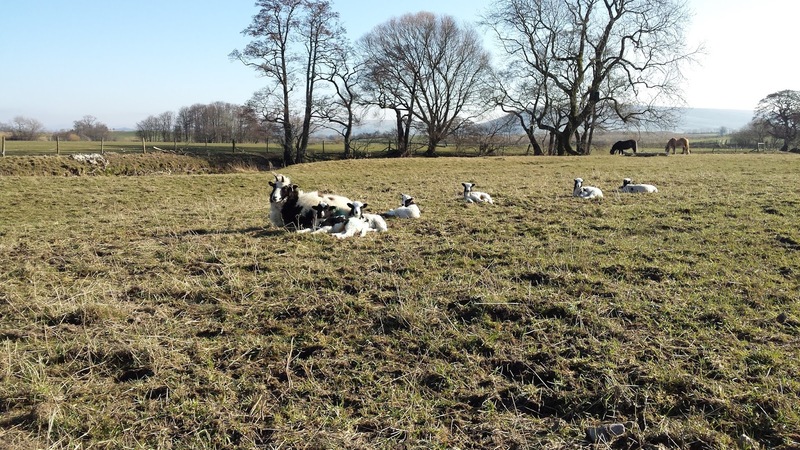 The trials and tribulations of managing land for wildlife, tipping my toes into sheep ownership and sometimes telling the stories of the ecology work we do away from Ellers Meadow. Ellers Meadow is just over 5 acres but we have grand plans for this riverside field in South Cumbria. We hope by sharing what we are doing we may inspire others to make space for nature and be the future custodians of our countryside. 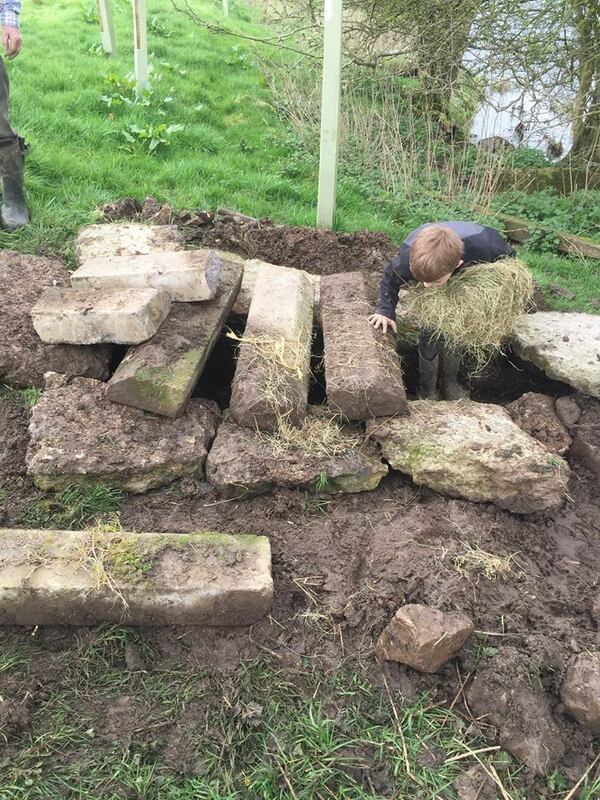 What to do on a Saturday if you have some kerb stones and limestone slabs and are fortunate enough to own 600m of river bank, build an otter holt! Otters are frequently seen on our river. A small otter holt already is known to be used under an alder tree on the bank but it frequently floods so we wanted to make something bigger, dryer and easyer to monitor. 1. 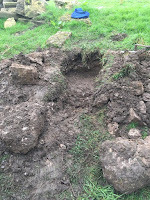 We dug a trench 4m back and 60cm wide into the bank, keeping a slight slope from back to front. 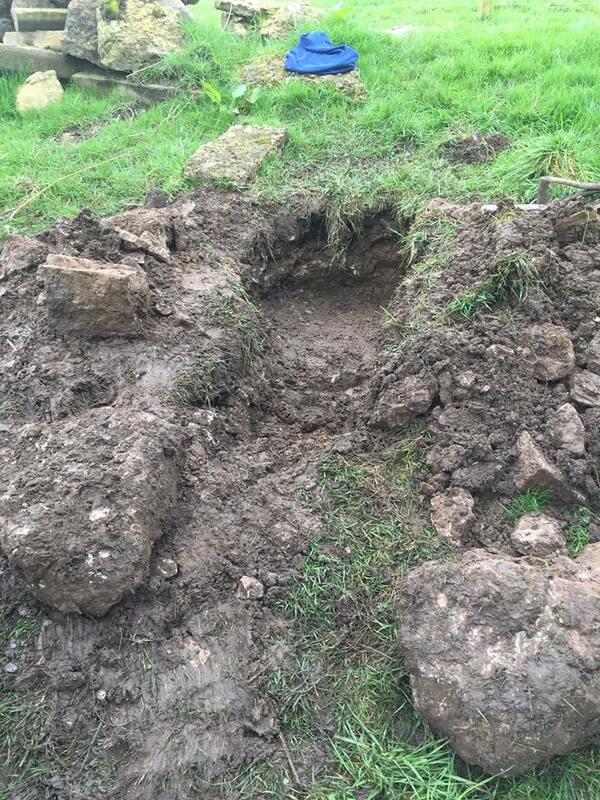 Depth at the back was about 80cm. 2. 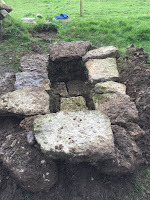 We widened a chamber to the rear to a width of about 80cm (kerb stones are 1m long which dictated the width). 3. 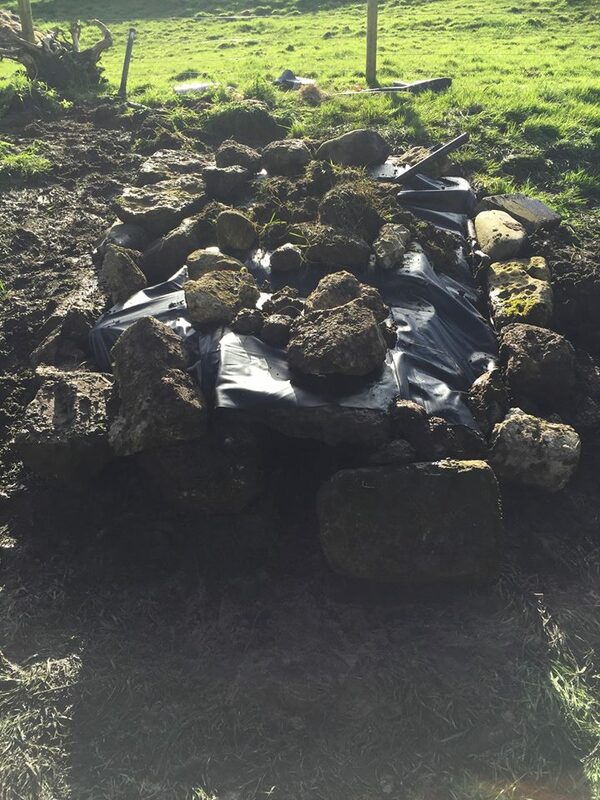 Lay stone flags on the floor of the chamber so it is raised of the ground and will stay dry. 4. 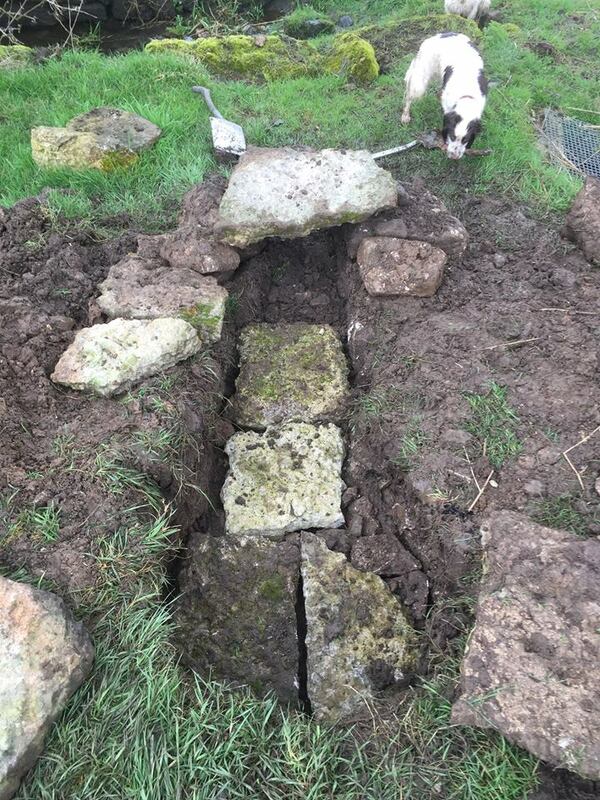 Lay slabs on the edge of the trench to spread the load of the kerb stones used to bridge the trench and chamber. 6. Cover with a PVC sheet to stop water entering, install a pipe in the roof of the chamber at the highest point with a u-bend on the end to stop rain entering but allow hot, moist air to vent from under the PVC sheet otherwise it would condense and drip water back inside the holt. Also allows an infrared camera to be lowered into the top of the chamber and the site is within wifi range of the primary school so potential for a live feed to be sent to the school. 7. 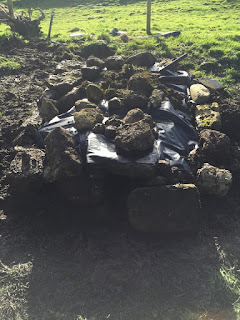 Cover with soil and rocks. 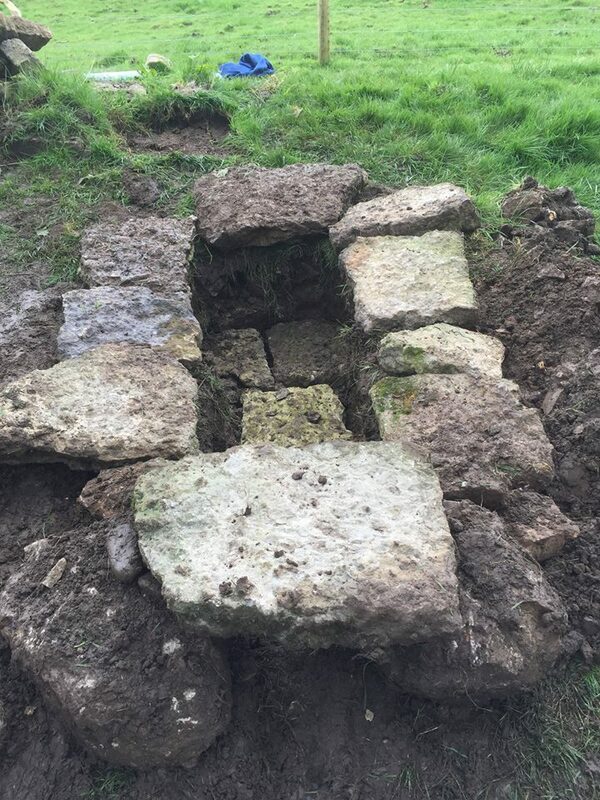 Reduce the entrance to the holt down using a tree stump and rock to reduce light entering and make it a more natural looking entrance. 8. 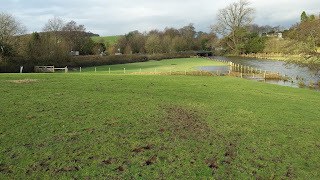 Collect spraint from the river bank adjacent and smear around edge of holt entrance. We have passed the longest day so I think I can finally say summer is here! 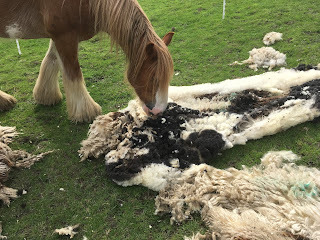 It has been a while since my last blog so I thought I would give a bit of a update as to where we are. 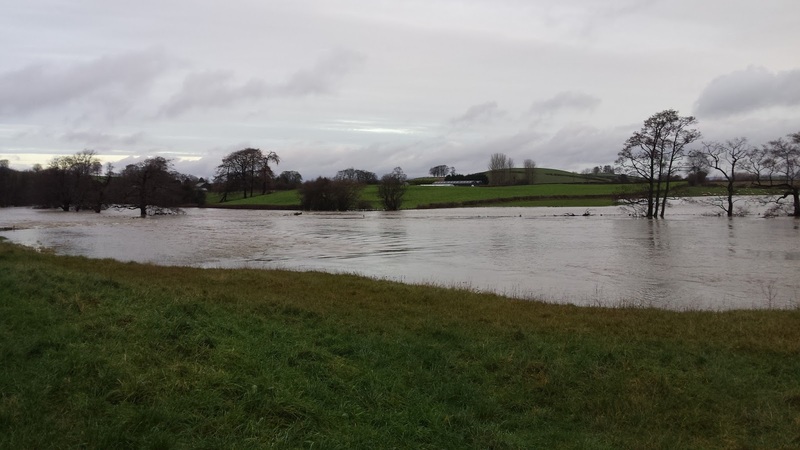 Ellers has now recovered from the December floods and looking full of life. 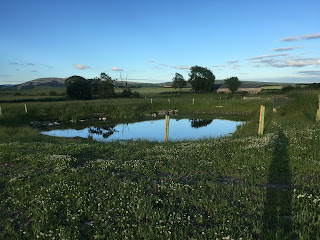 Our meadow around the the pond has grown well and we are looking forward to getting our first hay crop. Although we have put a a lot of wildflower seed down it still seems to be the grass species that are dominant in the meadow. To counter balance this we are hoping to get some yellow rattle seed from a local meadow down the road and if we can get the Yellow Rattle going this species is very good at absorbing nutrients from the soil and in turn should encourage more wild flower species. 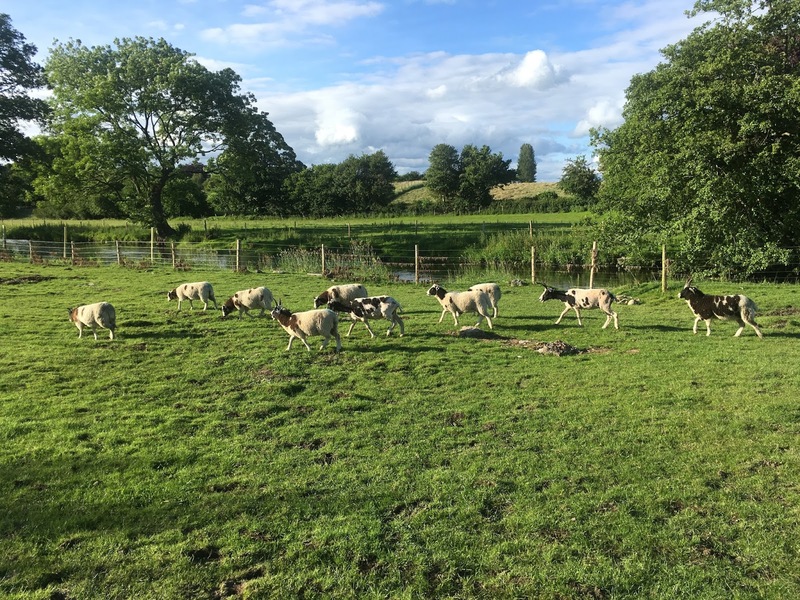 Our lambs are growing up fast and few weeks ago we had a very sheepy evening where the ewes and Rambo were sheared and the lambs were ear tagged. 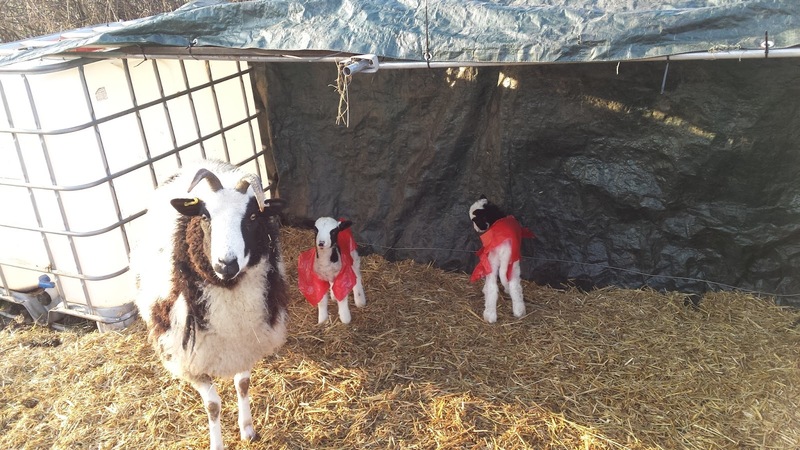 When we first bought our ewes they were quite wild and had come straight off a fell, but now I can proudly say they are bucket trained (well almost) and our mobile field shelter is a great place to do sheepy jobs. 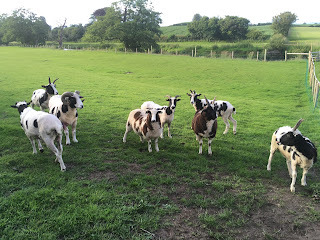 So now the ewes look like goats and it takes me a while to work out who is who without their fleeces. 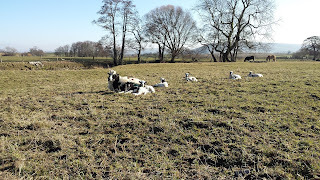 We have just got our pedigree certificates through for this years lambs and I must say it is very nice to see our flock name on a pedigree certificate and it makes those early morning lamb checks all worth while. 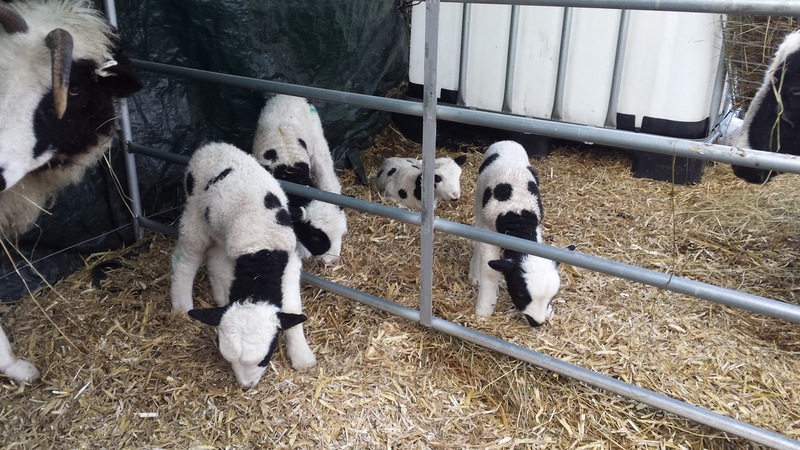 We also have a local buyer arranged for the lambs, who would like to start their own Jacob pedigree flock. 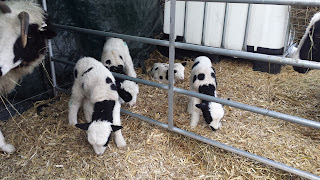 Ewes now look like goats! 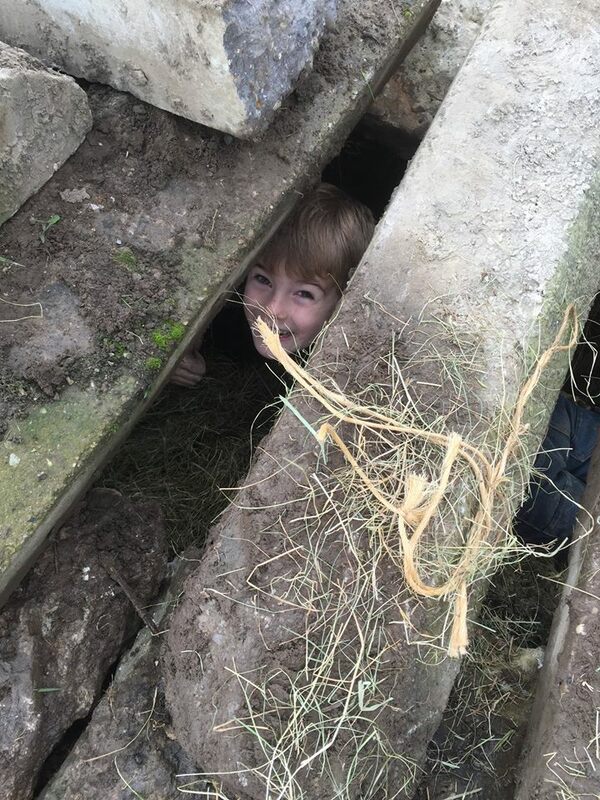 Rye always keen to help! The bees are doing great even with Andrew having to deal with two of the hives swarming. Although one hive completely disappeared never to be seen again, we managed to adopt another swarm near our house, which has now replaced the hive that disappeared! From last year just having two hives we now have six hives and are currently selling this years honey! 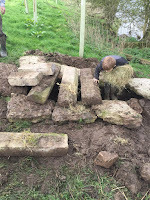 We have not had any Sand martins take up residence in the grand designs we made for them, but they are regular visitors on the river and we are hopeful that maybe they will make Ellers their home one day. The ponds still has some maturing to do, but we have reeds and yellow flag Iris growing and the Kingfishers are regular visitors. 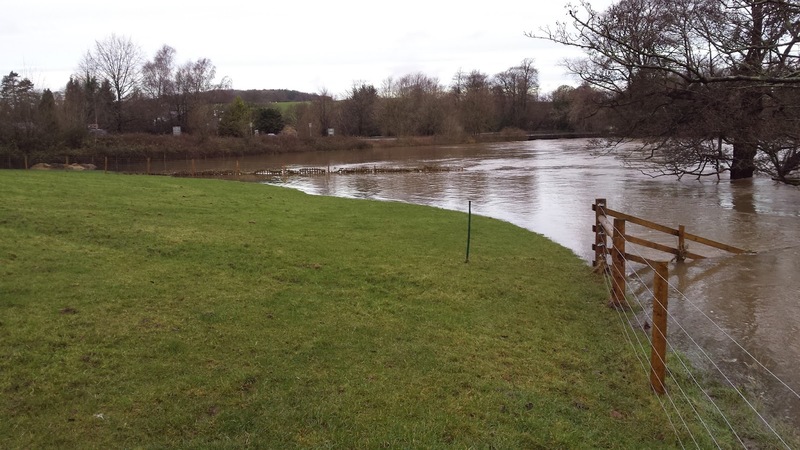 From not have much vegetation on the riverbanks we now have reeds and other vegetation growing that is helping the banks to stabilize after years of erosion caused by livestock entering the river. Our orchard trees are also growing well and our chickens seem really settled with Mary hen even hatching her own egg! 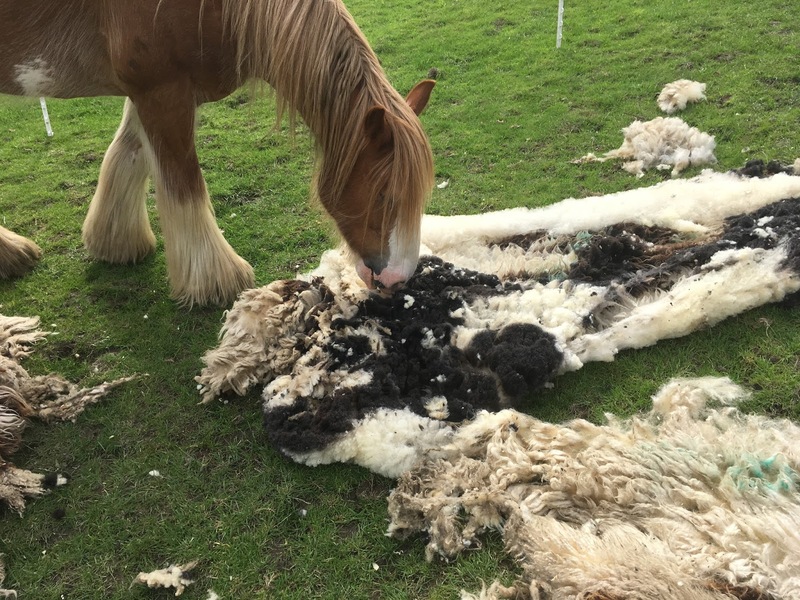 The ponies are also doing a great job balancing out the grazing meaning we have a truly mixed grazing system. As I write it has started to rain again, so here's hoping the weather picks up so we can get the meadow cut and enjoy the rest of the summer! Lambing - Who New An IBC Container Could Be So Useful? 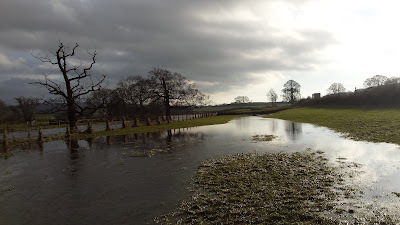 One of the wettest winters on record has resulted in Ellers being continually saturated and ironically the pond field has become the driest. We had thought about moving the sheep to our neighbours land, but the sheep had a refusal to load moment or two! 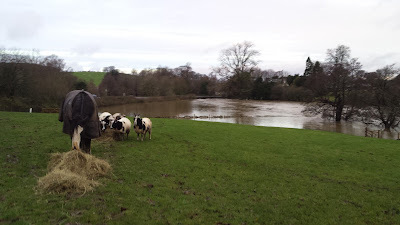 Meaning the pond field it was for our first lambing year! There was no way we were going to be able to move the field shelter as at the moment is mud glued to the ground, so we came up with the plan of making pens with shelter area out of hurdles, tarpaulin sheets and the sides were made out of IBC containers (large plastic contains used to store water and other farming feeds and products). Half term week was our due date for lambing and we started lambing right on time with Clover having twin ewe lambs on 11th February. 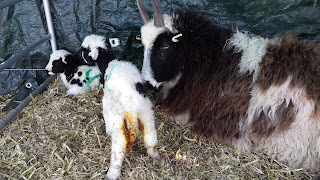 We only have five ewes and I am sick of saying the ewe with the forward facing horns and two spots on her side, so yes she is now called Clover and the other four ewes were named as they lambed too. 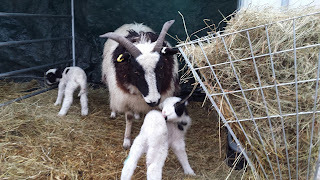 A couple of days later and two horns lambed with twin ewes again, then Jo, Bramble and finally Thistle on the 14th March. 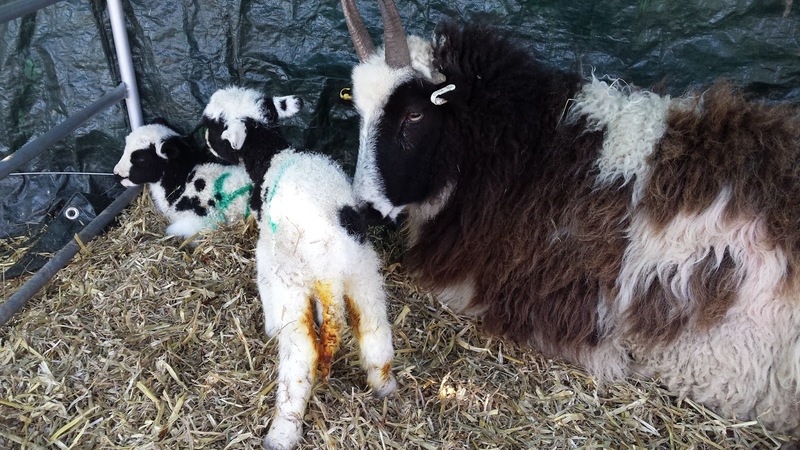 So now we have three sets of twins and two singles and fingers crossed things will continue to go ok with lambing 2016. 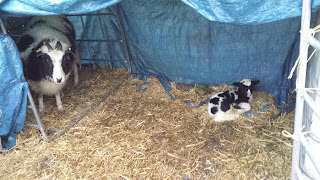 I think I now have a little more understanding of farming and have learnt so much with our first lambing. Although there have been a few worries at times so far I am still hooked on sheep! The benefits sometimes of getting up early! It flooded for one day and we had snow another day! Jo ewe on baby sitting duties! Camera Traps are Great - Otters! 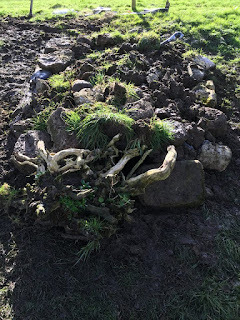 Every so often we find Otter spraint down Ellers, but a few weeks ago Andrew started finding spraints and Otter dinner remains in one place. This could maybe mean one thing, could we possibly have a holt under one of our Alder trees?! We have put camera traps out before, but had no luck in the past. Normally we get pheasants, ducks and rats, but this time we had a real chance of getting the Otter. So Matthew deployed his camera trap and we caught this great footage! Our next camera aim has to be the Kingfisher and Barn owl, so far I have only managed to get sketchy footage of the Barn owl on my phone camera. 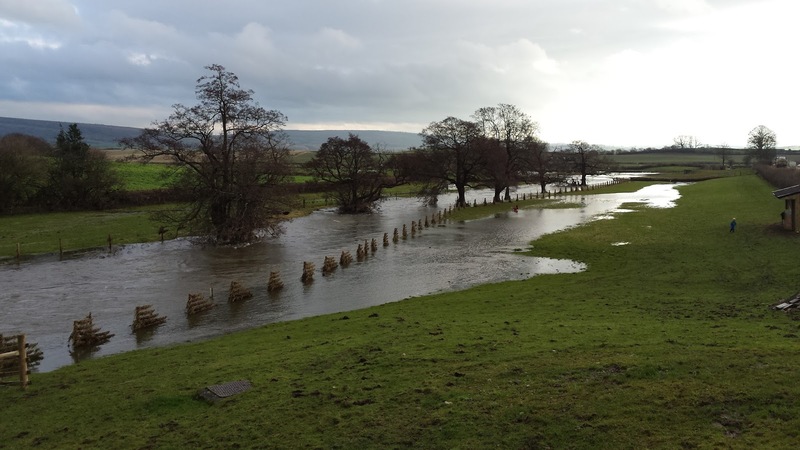 Storm Desmond Hits – Is Mother Nature Trying To Tell Us Something? 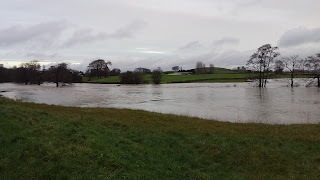 You don’t have to be Sherlock Holmes to realise if you have land next to a river at some point it is going to flood. 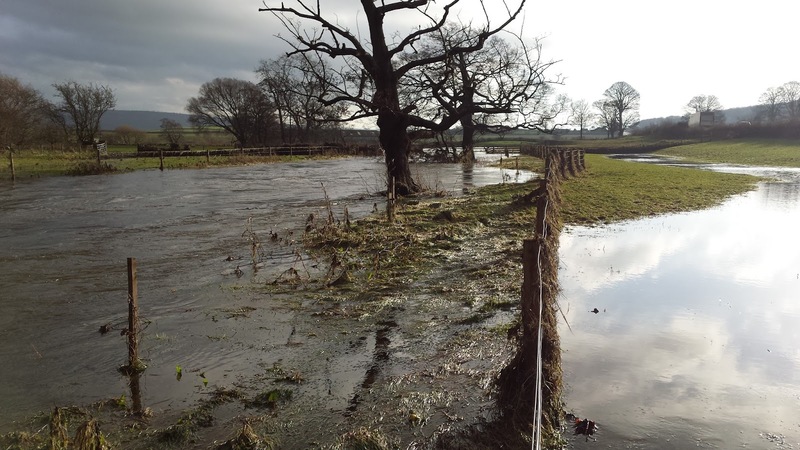 When we got Ellers last year we were very much aware of this fact and one of the aims of having Ellers was to show how to manage land in a flood plain. 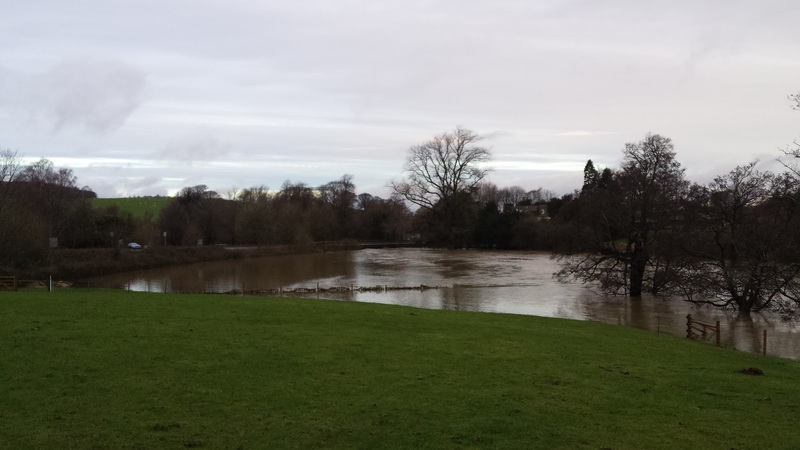 Flooding has always been at the back of our minds, but what a crazy 24 hours Storm Desmond brought. With already saturated ground and Environment Agency (EA) flood warnings changing very quickly from Amber to Red we knew the River Bela was going to be high, but we were not quite prepared for how high. 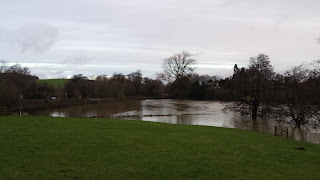 Saturday morning (5th December 2015) the Bela was nearly the same level as when it flooded on the 15th November 2015 so the question was 1) when is it going to stop raining and 2) how high will the Bela get this time? Our new mobile field shelter is located at the same level as the meadow and pond field where the chickens and bee hives are located. Previously until Storm Desmond these locations were considered the safe zones from flood, but as the day went on it was clear that these areas of the field were in danger. By 2pm on Saturday we started checking Ellers more regularly and by 8.30pm water was lapping at the field shelter doors and it was looking like the our two hen houses could also be flooded. 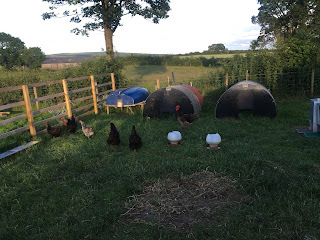 Our sheep and Smudge (Emma who works for us horse) were locked out of the field shelter and encouraged with hay to stay on the hillock (highest part of the field) and the hen houses were put on bricks. Everything that was in danger was moved to the hillock and then all we could do is keeping checking on animals through the night. I did the last check at 12.30am and Andrew and Ray checked about every hour and half until 5:30am. 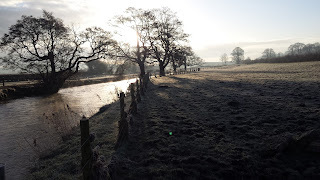 One good thing came out of the night checks as we did have a glimpse of the nocturnal life at Ellers with our local Barn owl taking shelter on our fence posts and being an opportunists as she hunted the edges of the flood water. The kingfisher also had new feeding grounds and did not seem bothered about us humans. Our worry was that the water was going to go over the Beetham road bridge and if that happened then things were going to get really serious. 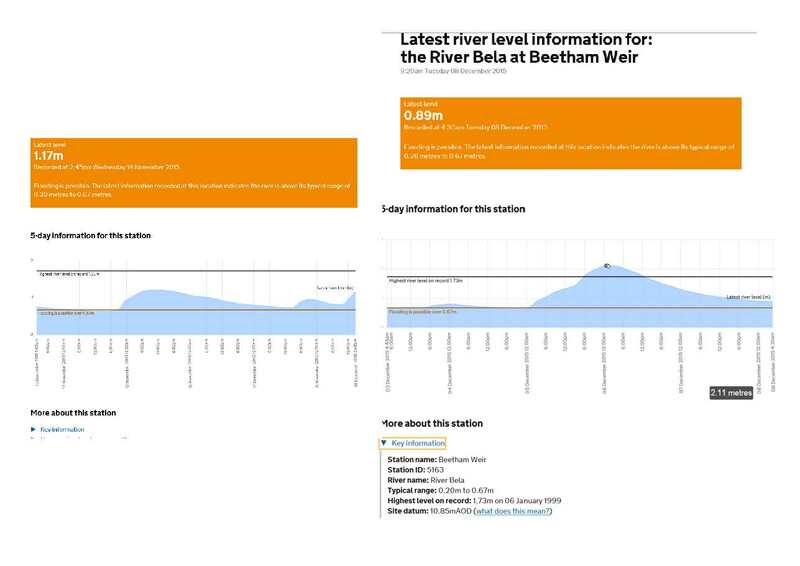 Between 3 and 4am the water peaked at 2.11 metres, which is the highest ever record level (previously the last highest recording was in 1999 and the water peaked at 1.73 metres). 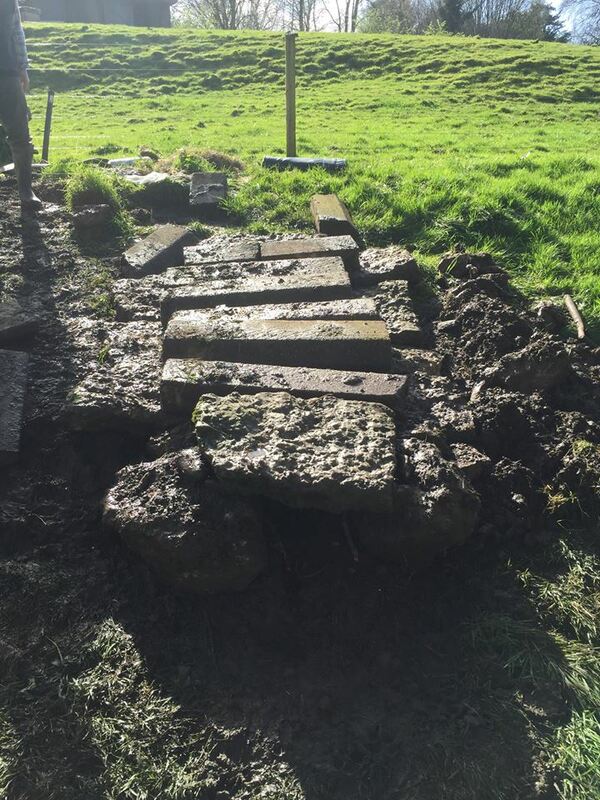 This resulted in over a foot of water through the mobile field shelter, water lapping under the Hen houses and importantly the water had reached the top of the arch of the road bridge. By 5am the water level seemed to be similar, but by 6.30am the water started to thankfully retreat slowly and it had stopped raining! Huge relief! Animals all safe on the hillock, hens saved by bricks and the flood came within 14cm of the bee hives! 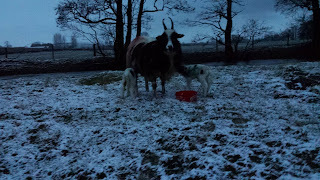 Sunday 6 December - Animals getting some welcome hay! 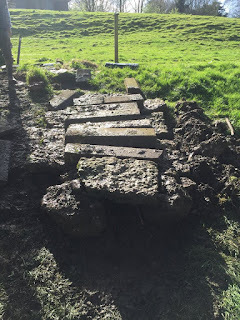 By Mid morning Monday (7th December) the Bela was back to a more normal level and we escaped lightly with a couple of fence repairs and field shelter to muck out. 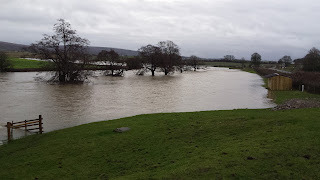 However others were not so lucky and Bela flooded homes (many never flooded before), Beetham Paper Mill, roads and football pitches. Trees planted last year made it though the floods! 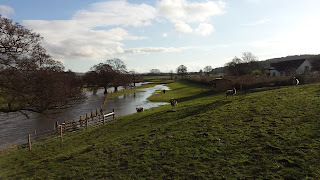 Is this a once in 100 year flood event? I am not too sure, with climate change our weather is evolving and flooding is just one element that we are going to have to adapt too. 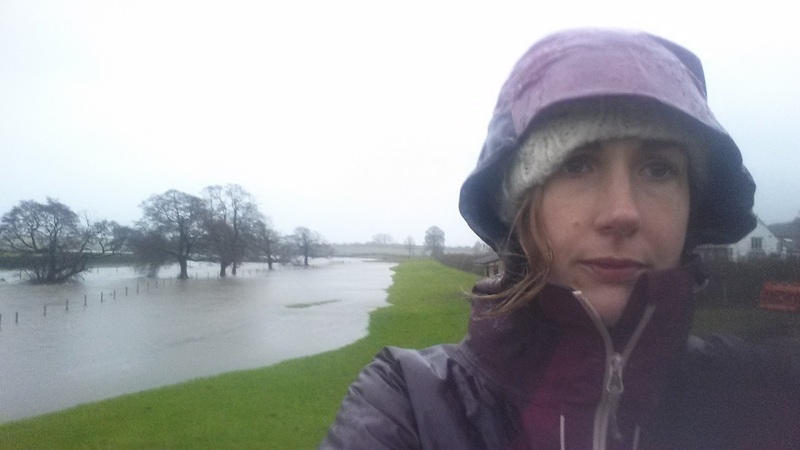 I have now lived in Cumbria for 10 years and have witnessed many floods in the Lake District and between 2005 and 2011 every November I experienced big floods. 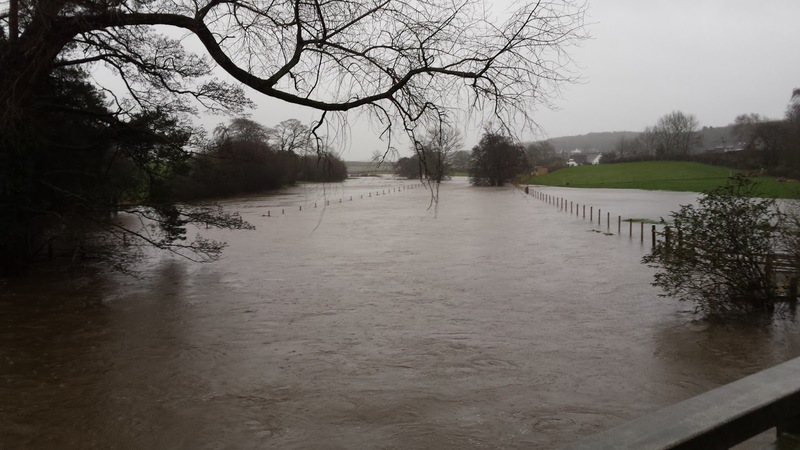 I always say that if it rains in the Lake District for more than six hours there is a risk of flooding! There is still standing water in many fields and I can already hear the echo’s of many land owners saying we need to dredge the rivers and ditches, but I really believe we are past this thinking and we need to apply some science and common sense to the situation as it really is inevitable that in some areas you are always going to get flooding. 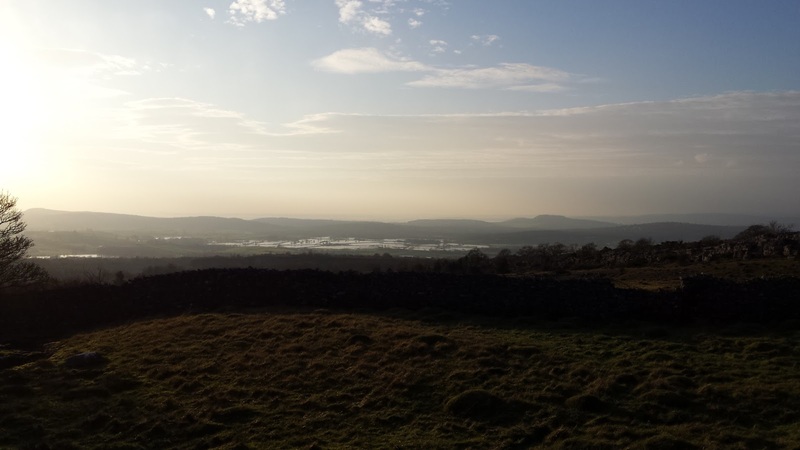 For example just down the road from Ellers we have an area called Hale Moss, which has been massively drained for farming. However, this area at one time was a glacial lake, then a moss and is now mainly farmland with moss habitat around the edges. When we have lots of rain the area just reverts back to its natural geology of a lake until the water subsides. 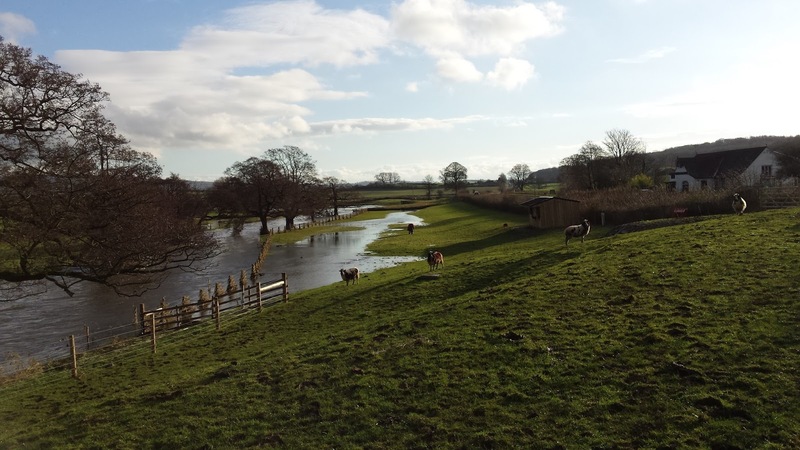 We all need to change how we manage our land and not on an individual basis but as a catchment. By looking at whole landscapes and zoning it for different land uses we could make a huge different to how we deal with big flood events like Storm Desmond. The journalist George Monbiot is quite rightly highlight these issues (http://www.theguardian.com/commentisfree/2015/dec/07/hide-evidence-storm-desmond-floods-paris-talks), although the question is will the government and large land owning charities who could make a difference listen and also speak out? We called in to the Heron Corn Mill this week and I found myself being in awe at seeing the migrating Atlantic salmon and Sea trout jumping up the fish pass to get to the spawning grounds at Ellers Meadow and beyond on the River Bela . 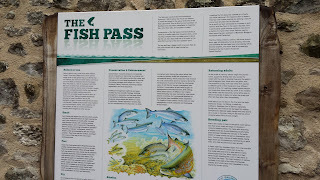 For hundreds of years fish were unable to reach spawning ground further up the River Bela, but then in 1990 a fish pass was put in by the Environment Agency. 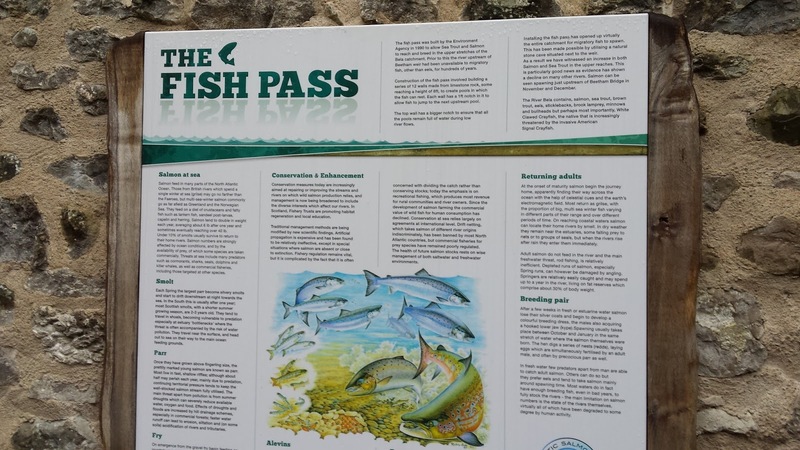 By looking down on the fish pass from the viewing area it seems a very simple construction, however it is made up of a series of 12 steps with pools to allow the fish to have a rest areas before they take the next leap. 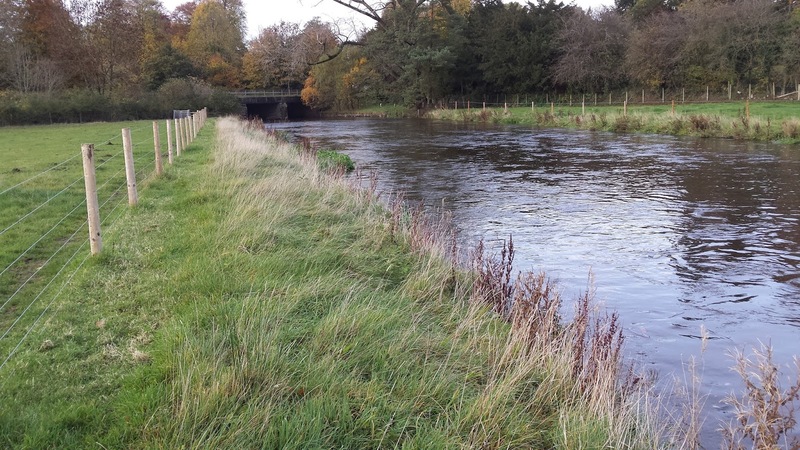 This engineering feat made a significant conservation gain overnight and the Bela is now recognised locally as being a very important river for spawning Atlantic Salmon and Sea Trout. 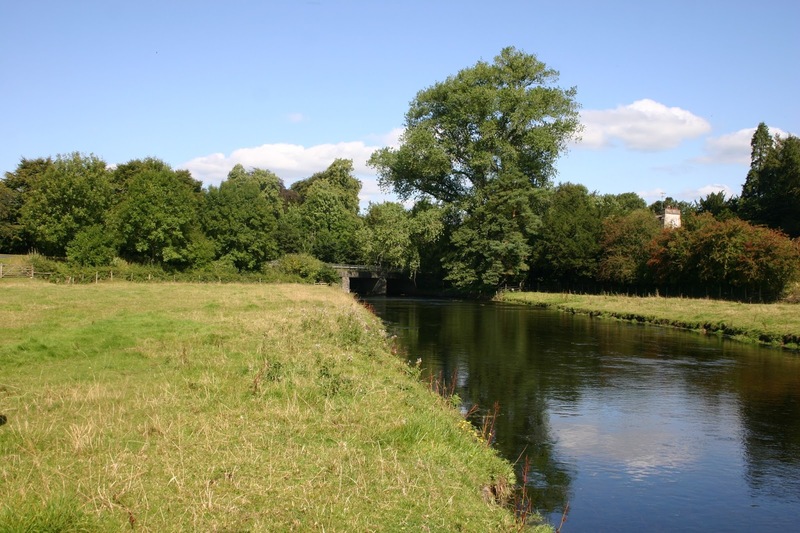 Although migrating fish can now move up the stream to their spawning ground there are still parts of the River Bela that need better habitat management to maintain and increase fish populations. The river fencing work we did last November at Ellers Meadow with a more extensive livestock system means another part of the jigsaw is now getting the right management. 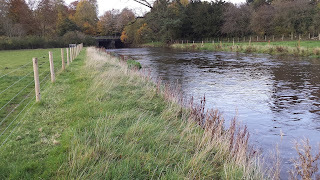 Like the fish pass the answer to better river management is simple, fence the riverbanks to cut agricultural pollutions levels and get the right land management adjacent to our rivers. 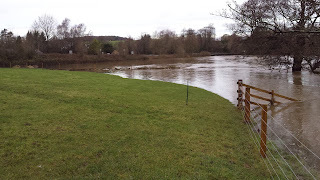 Although the river has only been fenced a year, the river banks at Ellers are already look more stable and agricultural pollution and riverbed disturbance has ceased. 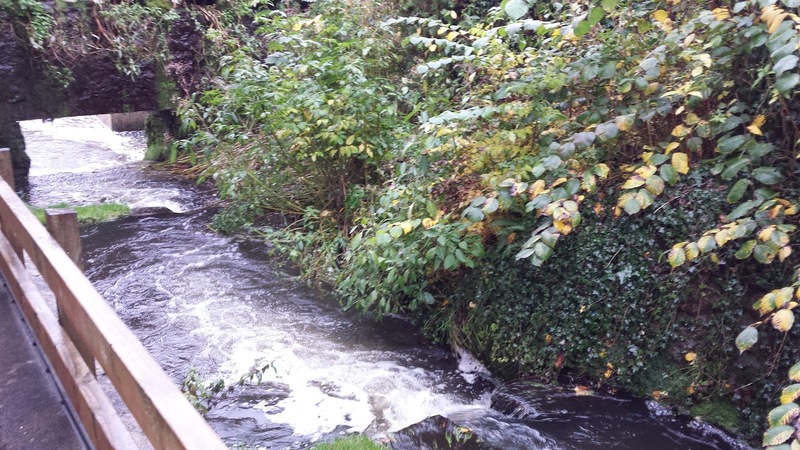 Although the fish pass happen 25 years ago, it is only now that the habitat management at Ellers has changed for the better! Note: If you would like help managing your river contact your local Rivers Trust. 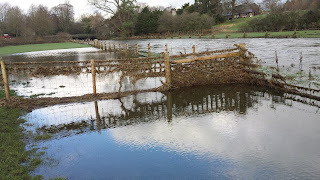 We worked closely with South Cumbria Rivers Trust and Milnthorpe Anglers Associations to fence off our river. Our Tup is cleverer than he looks! 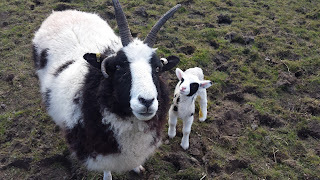 Last November we bought five pedigree Jacob sheep and earlier this year we managed to buy a nice tup from ProCo a small animal care college near Wigan. Being with the College he has already been named by the students and he is called Rambo! 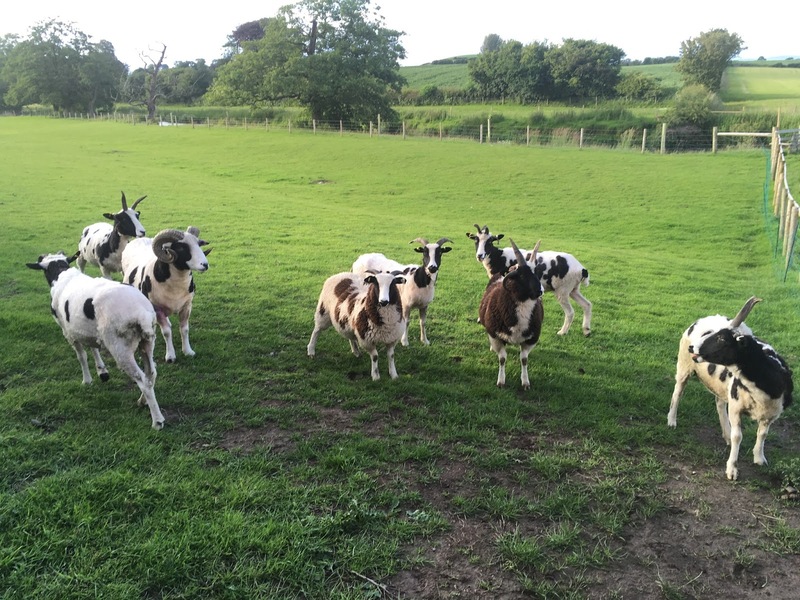 Having a very small herd the dilemma is always should we keep Rambo with his ladies? 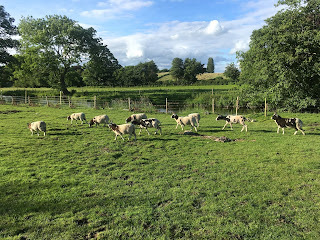 After consulting farming family and friends we came up with the plan that Rambo should stay with the ewes until it was time to take him out and then we would put him back in with the ewes at tupping time. This is normally around November to get Easter lambs (sheep gestation period is 152 day or around 5.4 months). After some happy weeks with the ewes we decided in July it was time to move Rambo to the end paddock. This was not an easy task in its self, but Andrew and Ray managed to split them up. Rambo then seems to go into depression, to start with he did a lot of pacing and then he seemed to sleep a lot. A week a so a go we had a very stormy night and the next day on animal checks I had to do a double take, Rambo was not in his field, the fences were not down and then I realised he was back with the ewes! 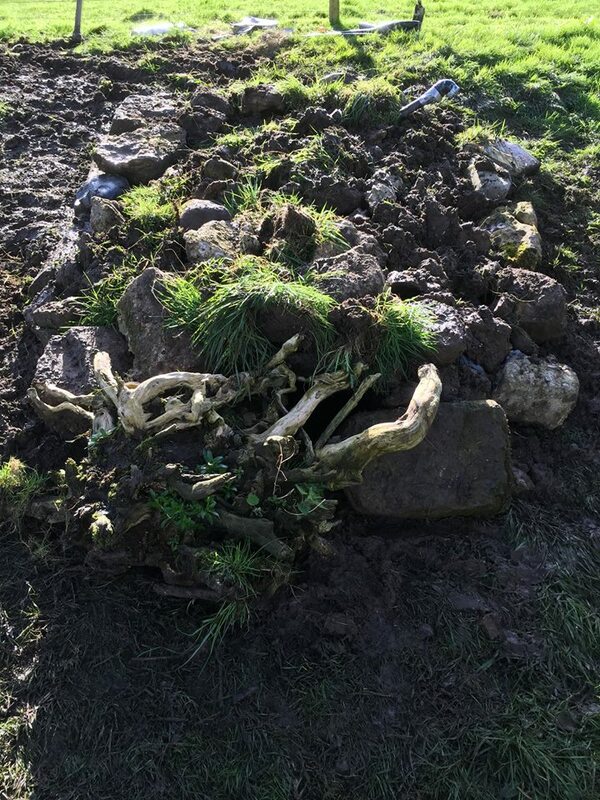 I came to the conclusion that human intervention must be at play here and the gate must have been opened for him. 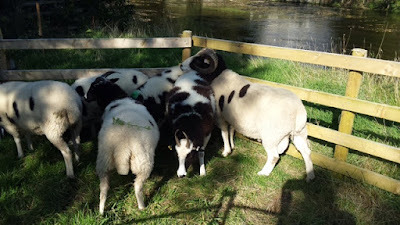 However later that day we managed to get the sheep in again and split them up, but to our astonishment we then watched Rambo jump the fence! So back to the drawing board, we either get deer fencing or is there something else we could try. Deer fencing is not an option so we bought Rambo a ‘ram apron’ (I will let you google this!) but all I can say is it lasted 48 hours, before Rambo somehow broke the straps. So now we have concluded that we are going to let nature take is course and have a happy tup instead and expect early lambs. 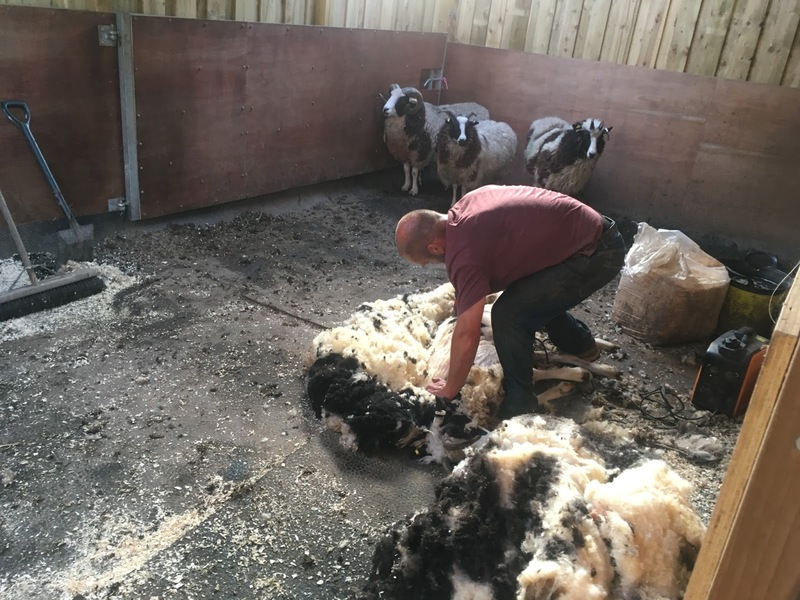 We are not a fell farm we just have five ewes after all! 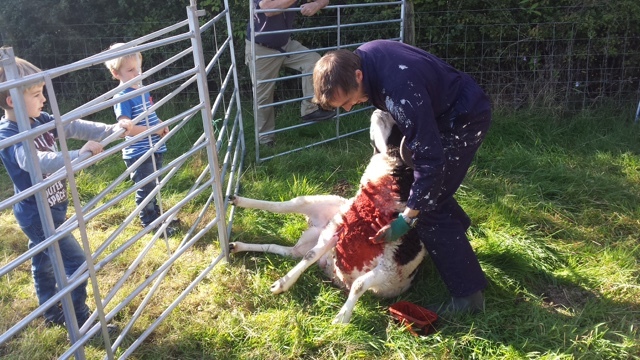 Rambo getting his raddle maker put on, so hopefully we can predict when the lambs will arrive! Away from Ellers Meadow I am either running Envirotech Ecological Consultants with my husband Andrew Gardner or looking after our two boys. Both Andrew and I have spent over 15 years advising clients about ecology and land management, but now we have Ellers Meadow we are enjoying our own conservation work.